Is GNOME 3 going to melt your laptop? This will upset people who are docked or using a laptop for a presentation with a projector. Worry not! If you have more than one active screen connected to the machine, then we’re going to just disable the internal screen and not suspend until the second screen is removed. This will upset some macbook owners if they connect a projector and then shut the lid. 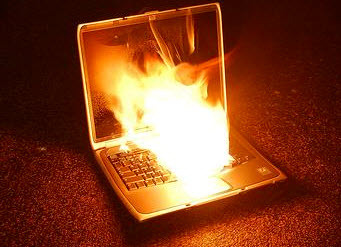 Some macbook laptops overheat when the lid is closed and not suspended, leaving the owner with a hot white glooopy mess when they finish their presentation. This is something we can do something about, but I need the help of the community to work out what makes and models need to be blacklisted. If you own a laptop that gets very hot and starts to smell like hot plastic if you shut the lid without suspending, please send me the output of dmidecode and I’ll add the entry into upower. Thanks. EDIT: Comments are now closed. Please see this entry from Allan Day. If you can’t squeeze options we need into the UI, then maybe it’s the UI design that’s at fault. That said, the influence of UI designers should not extend into preference panels, preference panels are the land of disputed defaults. I want my laptop to remain on while the power is connected, regardless of whether the lid is open or not. I also want more options, not less. I know it’s been said, but I can’t disagree strongly enough. Like so many other people, I prefer my laptop to blank its screen when I shut the lid. I agree with making suspend the default, as more people expect this. However, there is _absolutely_ no reason to remove the option from the GUI. It is _obvious_ that there is a strong demand for this feature from the users as demonstrated by the posts in this thread. So I’m asking you Richard, if you’re not listening to your users, who are you listening to? The designers. I get negative feedback all the time from the UI designers, so now I’m going to leave it up to them. I strongly object to this new behavior! Taking away that option is crazy, it’s like when one goes to bed, light is automagically switched OFF (just off, no questions asked) and it doesn’t care if I want to read the freakin book before sleep! I have good use case about which i laugh at my couple of mac friends: we have a large multi floor office here. We have to move to different floor at the same time we are connected to wifi and various resources, for instance we are running report from DB, connected to some ssh and so on. When I close the lid and move around – I have no problems whatsoever, because I have disabled suspend, mac users can’t do this and they have to move around either with open lid or don’t carry coffee/notes or other stuff around. This is essential to LEAVE A CHOICE to USER not taking apples approach of the “right and the only proper way” of doing things. Linux is about choice not about doubtful defaults! Please make this an option (not too hard I guess)! Make it a ‘Default override’. Plus a hint for people, who do not know what they do, that they could set their home on fire. I guess it takes less time to do it (keep the ‘Keep services up on closed lid.’ option) than to discuss it.